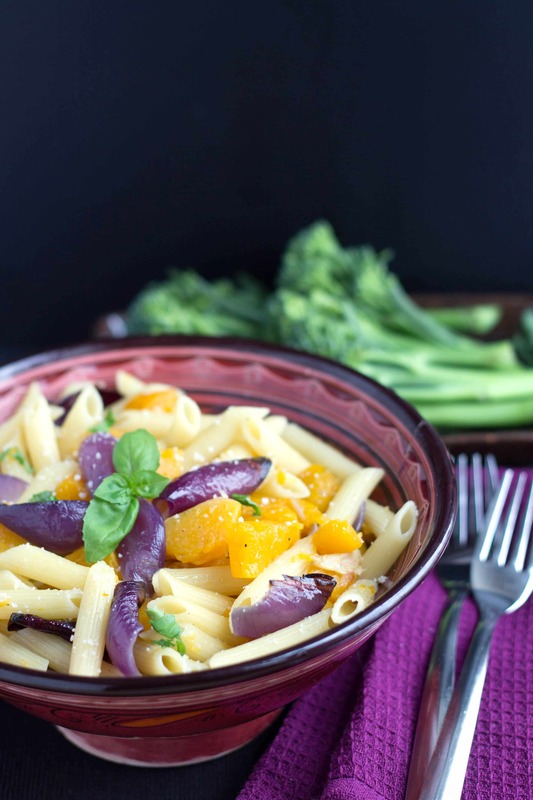 Roasted Squash & Red Onion Pasta - Erren's Kitchen - This recipe makes a satisfying and healthy supper that gives Italian pasta an autumnal twist. 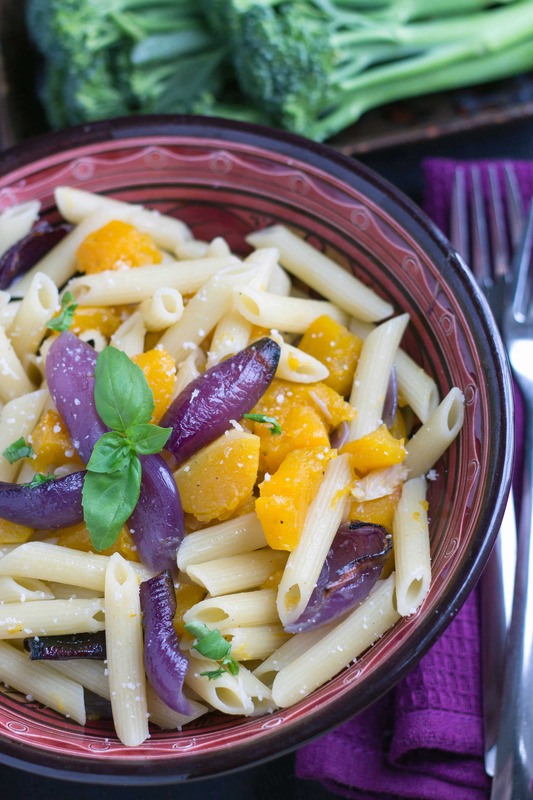 This recipe for Roasted Squash & Red Onion Pasta makes a satisfying and healthy supper that gives Italian pasta an autumnal twist. This recipe also makes the perfect vegetarian dinner party dish. 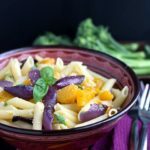 Butternut squash is a real seasonal favorite that brings loads of color to so many recipes – I’ve seen recipes for butternut squash soup, stews and even butternut squash muffins, but you don’t often see pasta and squash together very often. I based this recipe on one I found in a BBC cookbook years ago. The original recipe called for some sort of cream, but I wanted to make a low fat, healthy meal. 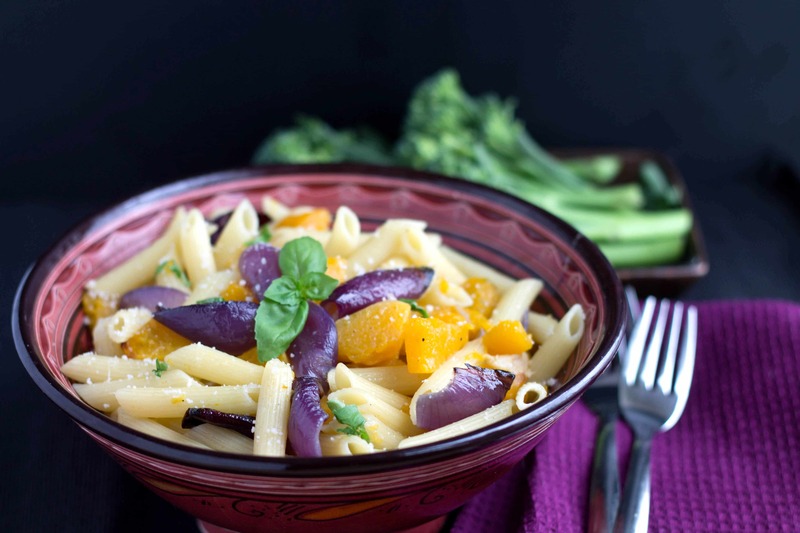 Using the pasta water and mixing it with crushed roasted garlic, makes a really flavorful and healthy sauce that uses no added fat. I also roast the vegetables using a low fat cooking spray (although the recipe calls for olive oil). That way, I can load it up with plenty of grated cheese without the added calories or guilt! This is really simple to make. You start with cutting the vegetables into bite sized pieces. Coat it in olive oil (or low fat cooking spray), seasoning and roast it for 30 minutes. Toss it with the pasta, some of the pasta water and Parmesan cheese and it’s pretty much it (of course I skipped a few small steps, but it’s really quite easy and packed with flavor). Preheat the oven to 400f/190C. Peel and de-seed the squash, then cut it into mouth sized pieces and add it to a roasting pan. 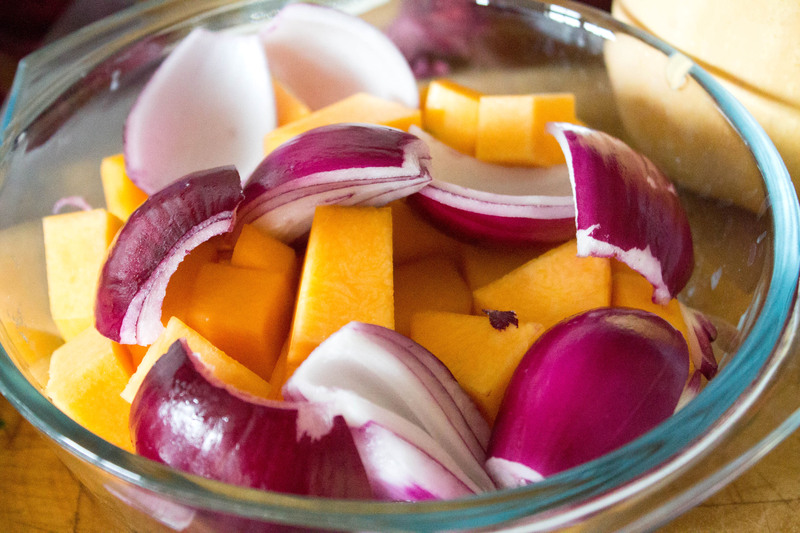 Peel the onions and cut each, into eight wedges and add them to the pan. Add the garlic and coat it all with 2 tablespoons of olive oil. Season generously with salt and pepper and toss everything together. Meanwhile, cook the pasta in a large pot of salted water following the cooking time on the package. Drain the pasta, reserving ½ cup of the cooking water. Remove the pan from the oven, smash the garlic with a spoon into a paste. Add the pasta and a bit of the cooking water and coat well with the garlic. Add some Parmesan cheese and mix to combine adding more pasta water if the mixture becomes too dry. Serve with extra grated Parmesan cheese and chopped basil. 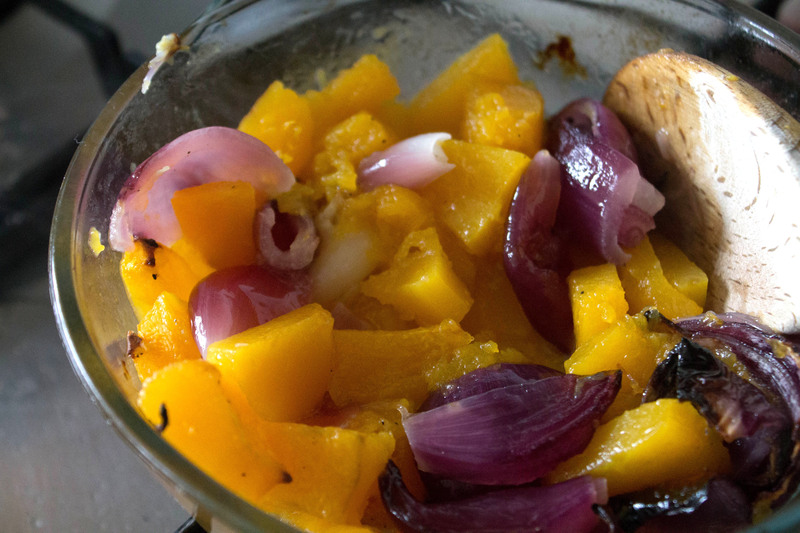 Hi Erren, LOVE LOVE LOVE this recipe!